IMG_9888, originally uploaded by bucklesw1. Largest herd of performing pachyderms under the big top in America! Probably the largest herd of performing elephants under an American big top this year was seen on June 2 in Shiloh, Pennsylvania, on the Kelly-Miller circus. “From the Kelly-Miller ranch in Oklahoma” were two herds under the combined direction of Armando Loyal (left) and Jason King (right). 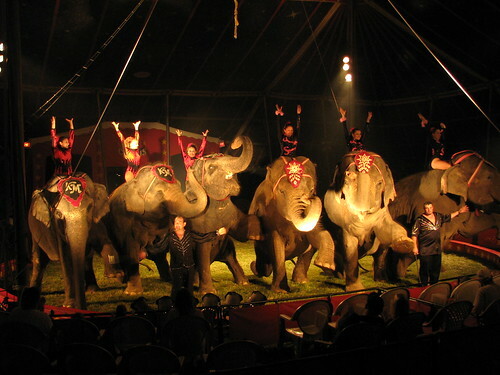 The event occurred when Cindy Migley’s Circus Spectacular date for Philadelphia’s Lulu Shrine Temple in Plymouth Meeting, Pa., closed and the show with Jason King and three more of Barbara Byrd's large herd was headed to the Chicago area but laid over for a day to visit John Ringling North II’s Kelly-Miller show. Richard, thanks for sharing the event with us. Great photos. So this means that John Pugh's Cole Bros, Circus of The Stars now has the largest herd umder the big top today....he's got five ?! That is correct Paul. It is the only 5 act left in the country that works in a ring other than the RBBB full arena displays.